Self-taught musician, Sunao Wada began playing the guitar at the age of 11, and at an early stage of his career decided to become the "No. 1 blues guitarist in Japan." Now he says that there's no "No. 1" in music, but many people in Japan agree that he did become just that. 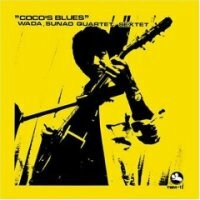 Coco's Blues is Wada's first leader album, and an all-blues album at that, recorded in 1972. Three numbers were composed by Wada himself, one by the pianist of the session who is also known for his blues chops, and one by Charlie Parker ("Billie's Bounce"). Alto sax player Kenji Mori and flugel horn player Kunji Shigi join the quartet and stretch out on two numbers. If you have a slightest doubt as to whether a Japanese guitarist can really play the blues, I have only one answer: Listen! Produced by Takeshi Fujii. Recorded October 23, 1972. Blu-spec CD is compatible with all regular CD players. Paper sleeve special limited edition.